Each comprehensive photographic dictionary is but one component of these wonderful parent resources. 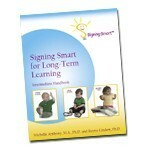 Each book also includes a host of research-proven strategies and techniques to make signing with your hearing baby or toddler simple, fun, and successful from the very first day! All our materials use only ASL signs. This book goes beyond motivating parents to sign. It is a hands-on guide with step-by-step instructions on how to get started, as well as how to go beyond the beginning with strategies to make signing a natural part of your everyday interactions. Photo dictionary with over 100 ASL signs. 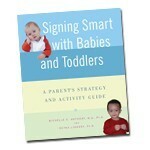 For families or caregivers who feel confident signing with their children. For those who seek to go to the "next level" to use signs as tools for conceptual development, facilitating longer signed and/or spoken sentences, and to enhance learning. 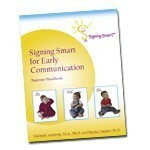 Photo dictionary with over 90 NEW ASL signs.